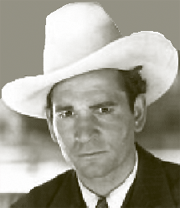 Enos Edward “Yakima” Canutt acquired his moniker at an early bronc riding event during his Rodeo career. He'd been raised on a ranch in the Yakima Valley, hence a nickname that would stick with him throughout his life. Most people with anything more than a passing interest in film or television magic are aware of the extraordinary stunt people who often risk their lives to make a motion-based medium more believable and realistic. Mostly unsung heros of film during the earliest years of the silents and early talkies, by the 1930s stunt people were beginning to organize to take a more proactive and equitable interest in their careers and professional security and safety. By the mid-1930s stunt men were being told, among other lies they'd been told for three decades, that they were no longer insurable, and therefore couldn't justify any increase in their compensation. Clearly a ploy of the shameless studio executives and their bean-counters, what the studio execs failed to realize was that stunt men and women weren't all brawn. Quite the contrary, in fact. Every stunt they performed, despite the bravado and pictures of reckless, fearless abandon they promoted to increase their own legend, the most successful stunt people were extremely intelligent, highly analytical and highly observant people, by nature. Let's face it, they had to be. At the time they had no union to look out for them, they were entirely at the mercy of the studios that they freelanced for, and the only way they could obtain anything like compensation commensurate to their risks was by exaggerating the risks of a stunt or gag. But as directors, producers and production assistants became more involved in the wider details of their productions, it became harder and harder to maintain compensation equity for stunt performers' risk-taking. Between 1933 and 1938 stunt people began to organize on several fronts. 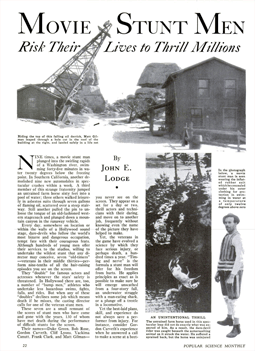 To assess their basic insurability, they invited Lloyds of London to a whirlwind tour of the U.S.--and its film production centers, to determine for themselves the degree to which a responsible insurer could quantify--and therefore underwrite--the relative safety and risks of the professional stunt performer. The tour was a great success for all concerned. In the course of the Lloyds tour, the idea arose of interviewing the most successful stunt people in the business at the time, for a possible retrospective on the lives of these heroic 'daredevils.' The twenty-six Daredevils of Hollywood episodes were the result of those ancillary recorded interviews. And indeed, Lloyds ultimately gave the early stunt performers' congress a green light as to their insurability. This effectively eliminated the studios' long-standing fairy-tale about not being able to insure either the stunts or stunt people, and stunt work soon became one of the most well-prepared, trained, educated and highly respected professions of the Film Industry. Most popular films of the 1920s to 1930s were comedies, westerns, adventure serials, and war films. Each action-oriented genre demanded expert horsemen, swordsmen, drivers, and specialists who could perform feats ranging from high falls to self-immolation. The earliest stunt performers were recruited from vaudeville theatres, Wild-West shows, racing car circuits, and the ranks of barnstormers. Grave injuries and deaths were regrettably common among these early stunt performers. To literally add insult to injury, though stunt performers were an established craft of the film industry by 1930, they still had no standard rates of pay. Quite the contrary. Many stunt people worked for ten to fifteen dollars a day, irrespective of the stunts they were asked to undertake. It wasn't until The Charge of the Light Brigade (1936), that stunt people demanded $36 a day--plus adjustments--for the more complex stunts they were asked to undertake. 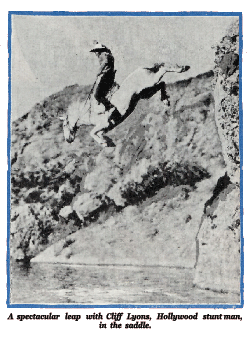 The highest fee reported during the 1930s was $2,350 to Cliff Lyons for jumping two horses off of a cliff during principal photography on Jesse James (1939). The more experienced, seasoned stunt performers had long realized that it was better to perform a handful of types of stunt successfully and professionally than to simply ad-lib a broader number of stunts poorly. Westerns understandably required good horse people. Period dramas needed stunt people who could move well in period costume while often wielding sharply-edged weapons. Thrillers, gangster films and war films demanded experts in vehicles, explosives and firearms. And of course, slapstick comedy films of the Laurel and Hardy, Keystone Kops, 3 Stooges, Buster Keaton, Charlie Chase, etc. variety, plowed through hundreds of acrobats, tumblers, pratfall comedians, and specialists in water, ice, snow, and flying stunts. Stunt coordinators rightly began working alongside first and second unit directors to oversee the logistics of stunt-heavy scenes. The first films to utilize stunt coordinators were also some of Film's most successful action films ever: The Adventures of Robin Hood (1938), Beau Geste (1939), The Sea Hawk (1940), Duel in the Sun (1946), The Three Musketeers (1948), and Don Juan (1949) all employed an experienced stunt coordinator working hand in glove with his or her production counterparts. 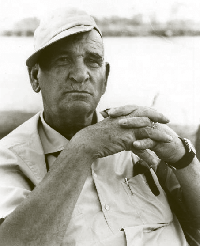 The leading lights among stunt perfomers and coordinators were the aforementioned Cliff Lyons as well as Richard Talmadge, Otto Brower, Bob Clark, Slim Talbot, James C. Havens, and the legendary Yakima Canutt. Female stunt performers, though less common, were also gaining notoriety, such as Ione Reed and Eileen Goodwin. 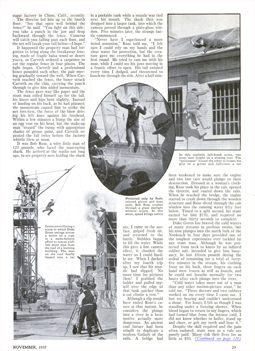 Indeed, in 1938 Popular Mechanics magazine reported that there were only an estimated seventeen professional stunt men working regularly in Film and only six professional stunt women. We suspect that those figures referred to organized, professionally represented free-lance stunt performers. The studios were still employing many unclassified studio workders and free lance contractors for stuntwork--illegally mostly--as of 1938. The Daredevils of Hollywood profiled virtually every major stunt person of the era. 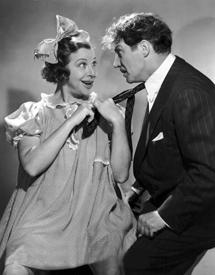 Ione Reed and Matt Gillman were profiled in four episodes each. Ione Reed, owing to her former supporting roles in early westerns--as well as her unmistakeable beauty and charm--seemed a natural to spark continuing interest in the short series. Stuntman Frank McGrath, while profiled twice during the series, was voiced by Radio and Film actor Buddy Edwards. Ironically, Yakima Canutt, arguably the most famous and successful stunt person of his day, came in for only one profile during the series. 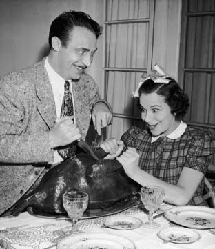 Canutt's well-publicized disdain for public notoriety, as well as his continuing appearances under various pseudonyms throughout the era in acting roles were undoubtedly the contributing factors. Many of the stunt workers of the era supplemented their income with bit parts in Film, but owing to the means by which they were compensated by the studios, went to great lengths to disguise their identities--or credits--in their acting roles. The studios of the era infamously paid scale to most actors they could persuade to perform stunts. The Daredevils of Hollywood remains one of those precious time capsules of American culture, first preserved in 'wax', and now digitized for perpetuity--an enduring reminder of the value of this national treasure we call Golden Age of Radio recordings. Network(s): CBC [CJRC, Winnipeg], NBC-Blue [KERN, Bakersfield], and a handful of U.S. independent stations. Run Dates(s)/ Time(s): 38-03-08 to 38-06-02; KERN [NBC-Blue]; Twenty-six, 13-minute programs; Tuesdays and Thursdays, 7:00 p.m.
39-09-20 to 40-03-13; CJRC [CBC]; Twenty-six, 13-minute programs; Wednesdays, 7.15 p.m.
RadioGOLDINdex, Hickerson Guide, Popular Mechanics magazine, Popular Science magazine. 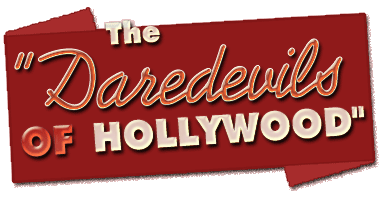 We have no idea whatsoever how the OTRR could have certified their "Daredevils of Hollywood" collection as both accurate and complete. Their circulating dates for the series are all off by seven weeks, they cite no sources for their 'scholarship' and apparently have no clue over which networks the series even aired--or what days of the week it was broadcast. As such, their circulating archive.org collection of The Daredevils of Hollywood is anything but complete and accurate. While this comes as no surprise given their utterly disappointing track record to date, it dismays us that--yet again--thousands of archive.org downloaders continue to exponentially disseminate inaccurate information throughout the vintage Radio collecting world. We've provided two catalogued runs of The Daredevils of Hollywood for comparison purposes only. 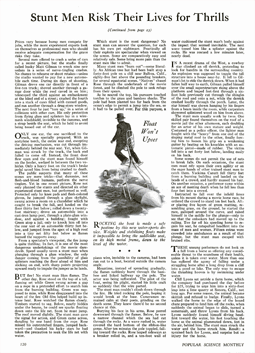 The first, which we believe as of this writing to be the earliest, aired over NBC-Blue beginning on March 8, 1938. 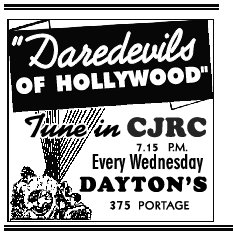 The Second completely identifiable run, aired over Winnepeg's CJRC beginning on September 20, 1939. The KERN run aired on Tuesdays and Thursdays at 7:00 p.m.. 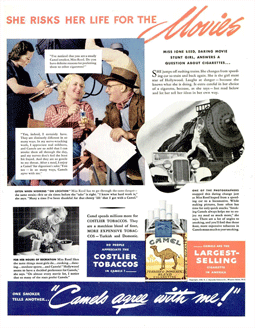 The 1939 Canadian run aired weekly on Wednesdays at 7.15 p.m.. The episode numbers and titles are purely anecdotal and we've coded them in 'red' for that reason. The circulating series apparently entered circulation from transcription discs, but no one has disclosed either the syndication or transcription source, nor the episode numbers of titles, if any, from the labels on those discs. If anyone can provide us those disc label titles and/or episode numbers we'll update them here for anyone to use as a resource. 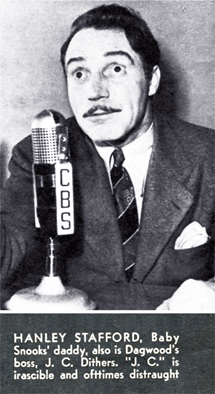 When the two radio shows ended after World War II, Stafford acted in motion pictures. Survivors include his widow, former radio singer and actress Viola Vonn; a son Graham and a sister.